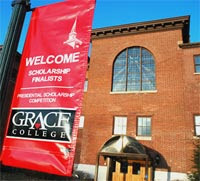 Grace College, Winona Lake, Indiana, will welcome 184 high school seniors to campus for the 2008 Presidential Scholarship Competition on February 22 and 23. In the competition, Grace will award more than $2.2 million in four-year academic scholarships. Competitors and their parents will enjoy a dinner, dessert, and student panel with former scholarship finalists on Friday evening. Then on Saturday, the competitors will participate in individual interviews and writing sessions. More than 60 faculty and staff will be involved in the interviews. The average academic criteria of the competitors is a 3.89 GPA, 28 ACT and/or 1260 SAT. Twenty-five states and two foreign countries are being represented, and more than 70 percent of the competitors travel to Grace from out of state.